Jennie Aberle, Author, The Purpose Plan, Amazon. Founder, SoulSeekersCommunity.com, personal/spiritual growth collective (launching Feb.) or jennieaberle.com for updates. 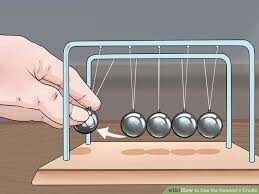 Do you know what a Newton’s cradle is? It’s that old toy you’ve probably seen a hundred times on executive’s desks and novelty stores, but never thought too much about. Yep. That’s the one. You may not have realized it, but there’s a strong lesson about life hidden in those metal spheres. How does this have anything to do with my solopreneur journey? Because for years I felt like those static balls — feeling stuck, hopeless, and immobile. Then suddenly my life was in motion — all because I took one step forward. Progress is simply about making the decision to move. No matter how big or small the movement, that action will can set off a chain of events that you may have never anticipated. The second part of my understanding on this is that when you do decide to take action — you have to get out of your own way. It’s more about listening, instead of directing; surrendering, instead of controlling; accepting, instead of demanding. I never would have anticipated the things I’m pursuing now when I was taking that first step. When you let go, it all unfolds as it’s supposed to. ➤Step 1-Writer: Started writing a book on personal development. I started this book thinking I’ll be a writer and that’s all. My more naive thoughts during this process: I’ll finish it, catch the eye of a publisher, receive an amazing book deal, Oprah’s book club here I come, no biggie, easy as pie = um, no. Though more than 25k words in — I put this book down in favor of another one further down the line. ➤Step 2- Blogger: I quickly created a website and pushed out a bunch of blogs — aiming to build a personal-growth blog. This was extremely time-consuming with zero reward. ➤Step 3- Speaker: I attempted to promote my writing through some local speaking events. Very time-consuming and not where I needed to be spending my efforts — at this time. Will circle back to this one day as I really enjoyed it. ➤Step 4- Guest Blogger: The personal blog was too much of a needle in a haystack, so I opted to write for other blogs, which I will continue to do. My work has been accepted at Change Your Thoughts, Good Life Zen, BuzzFeed, Tiny Buddha, and now with Thrive as an ongoing writer. Much more exposure for the same amount of effort. Remember the story of Cinderella? The Prince traveled around the village looking for the owner of the glass slipper. He tried the shoe on every woman in town but none were a match — until he got to Cinderella. That’s how this progression has felt. The moment the idea for the SoulSeeker Community hit me it felt like it was the right fit. Pull back, release, strike the first sphere… and let the momentum carry you. If you enjoyed please recommend by clicking the ❤ Sign up below for next week’s edition of Solopreneur from Scratch.